There’s no place like home. AW Health Care recognizes the importance of keeping clients in their homes, rather than sending them to a skilled nursing facility. Our personal home care program is designed to implement non-medical tasks to meet the clients’ physical needs. Our home care aides provide a multitude of services for our clients, ranging from meal preparation and house cleaning to personal assistance and running errands. We are diligent in our staff and client pairings. We won’t put just anyone in the your home or the home of your loved ones. All of our team members undergo a vigorous background check that includes random drug screening. We personally select your caregiver by meeting with you and your loved one so that we can gain a better understanding of your needs and pair you with a caregiver who compliments your lifestyle. Get paid to care for your loved one! We can help you direct your own care. At AW Health Care, we empower our clients. That is why we offer the Consumer Directed Services (CDS) program. CDS is available for Missouri Medicaid-eligible individuals with physical disabilities. This program allows individuals to direct their own personal assistance services at no cost to themselves. Our client becomes the employer and hires a personal assistant of his/her choice. Personal assistants help you or your loved one with daily activities like housekeeping, laundry, cooking, personal care and transportation needed to keep you safe and comfortable in your home. Through AW Health Care’s private pay (or private duty) service, we offer clients companion care, homemaker services and nursing services in the comfort of your home. 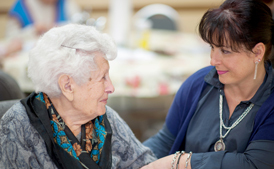 Our aides assist with a variety of services aimed to keep clients living in their homes. We set up our clients with caregivers who fulfill their non-medical care needs and provide companionship. Supervisory visits are routine. We closely monitor the relationships between our clients and caregivers. Let us customize a care plan for you or your loved one. Call us today for a free, on-site evaluation. In-home and community services are designed to assist seniors and disabled individuals avoid institutionalization. These services also help transition people in long-term care institutions back to their home and help people live safely and independently in their own environment. In-home and community services include homemaker and personal assistance services, chore maintenance, health screening, monitoring and maintenance. Missouri Medicaid covers these services for those who qualify. We are happy to speak with you and schedule an assessment to see if you qualify for services. AW Health Care is certified by the Missouri Department of Mental Health as a provider of community-based services for eligible individuals living in St. Louis City and the counties of St. Louis, St. Charles and Jefferson. AW Health Care helps people and families to improve their quality of life while allowing them to remain in the familiar surroundings of their homes and have full access to the benefits of community living. What is Personal Home Care? Personal Home Care is a program designed to implement non-medically oriented tasks to meet recipient’s physical needs and thereby enable the patient to remain in his or her home rather than at a skilled nursing facility. Services include meal preparations, cleaning and personal assistance. AW has trained aides and professionals to serve you!